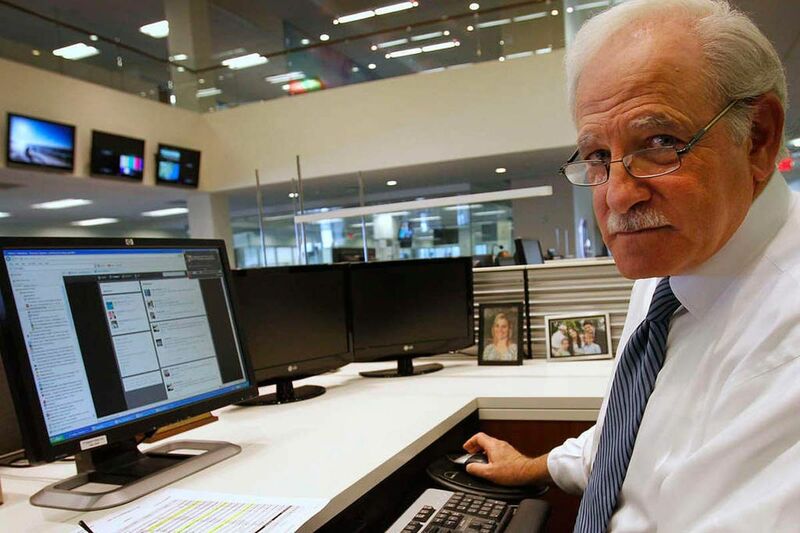 6ABC anchor Jim Gardner at his desk in April 2013. Once again, Gardner and his Action News crew were tops in the ratings despite some stiff competition, including the Olympics and the Super Bowl on NBC10. Not even the Super Bowl and the Olympics were enough to stop the ratings dominance of Jim Gardner and his colleagues at 6ABC. NBC10 experienced a ratings boon by airing both events. According to some measurements, the network's ratings were up as much as 73 percent compared with its pre-Olympics programming, and were even able to eclipse 6ABC's in prime-time on some nights. But that wasn't enough, as 6ABC led all local network stations for the month of February in nearly all parts of the day, continuing a run that goes back decades, according to the most recent Nielsen numbers. In particular, the 6 and 11 p.m. Action News broadcasts, anchored by Gardner, handily defeated the competition, including NBC10 News, which itself enjoyed terrific ratings thanks to its Olympics lead-in. For February, Action News at 6 pulled in an impressive household rating of 10 and averaged about 287,000 viewers, nearly tripling the 3.3 rating NBC10 News garnered. Eyewitness News on CBS3 finished third for the month, while Fox 29 News ended up a distant fourth. It's hard to overstate how big a 10 rating is locally in today's landscape of declining ratings and fractured viewing. It's actually on par with some hours of audience NBC10 pulled in for its Olympics coverage in prime time. Among adults 25-54, Action News drew a 3.6 rating, compared to NBC10 News' 1.4 rating. The numbers remained strong for World News Tonight With David Muir at 6:30 p.m., which drew an 11.3 household rating locally and averaged about 324,000 viewers a night, a massive number that dwarfed the viewership of Lester Holt's NBC Nightly News and CBS Evening News with Jeff Glor, who replaced Scott Pelley in October. Fox29, which airs the syndicated Page Six TV, finished a distant fourth. From there, 6ABC averaged a sizable number of viewers locally for Jeopardy! (312,000 viewers) and Wheel of Fortune (252,000 viewers) before ceding most of prime-time in February to NBC's Olympics coverage. But Gardner and crew won back the top spot for the month during the 11 p.m. newscast, drawing a 5.7 household rating and averaging a little more than 163,000 viewers. Meanwhile, NBC10 News anchors Jim Rosenfield and Jacqueline London drew a 4.4 household rating during the month, which is a big increase over January, thanks to the Olympics (though it's worth noting the two newscasts didn't always go head-to-head due to NBC's Olympics schedule). Among adults 25-54, the Olympics made it a closer right, but Action News still ended up on top with a 2.3 rating, compared to NBC10 News' 2.2 rating. "All I can say is…. thank you," Tynan said in a note to viewers about the ratings win on Facebook. "You are the best!" So what accounts for the unparalleled loyalty Action News has been able to accrue over the years? Maybe it's the presence of Gardner himself, who is a familiar face to generations of local TV viewers and shows no signs of letting up any time soon. "There's a lot of fake news out there these days. So much fake news. But one man has always given it to us straight," talk show host Jimmy Kimmel said of Gardner last year. "Jim has the gravitas of Walter Cronkite, the tenacity of Ted Koppel, and the mustache of Ron Burgundy. All the greats wrapped up into one." The perennial success of Action News may also be intertwined with the newscast's iconic theme song, which has largely gone unchanged for the better part of 50 years. Back in 1996, the network experimented with a updated version of the song, featuring the work of 400 musicians from the London Symphony and London Philharmonic. But angry viewers flooded 6ABC's switchboards, and the new jingle was pulled after just four days. "I didn't realize how emotionally attached people were to our theme," then-news chief Dave Davis told former Inquirer TV columnist Gail Shister. 'I'm certainly willing to admit we made a mistake." Correction: A previous version of this story incorrectly listed the ratings demographics as adults 18-49.